This seeded Asian cabbage slaw recipe is festive enough to be served around the holidays, or can be made for a casual, weeknight family meal. Packed with shredded wombok (Chinese cabbage – you can substitute plain white cabbage if that suits), crunchy nuts and seeds and a soy vinaigrette, this is sure to be a hit around your table! Step 1: Lightly toast the sliced almonds, sunflower seeds, and sesame seeds in a skillet or toaster oven. Toast the sesame seeds separately; otherwise they will burn. Allow to cool before tossing in salad. Step 2: In a small bowl whisk together the oil, vinegar, soy sauce, and honey. 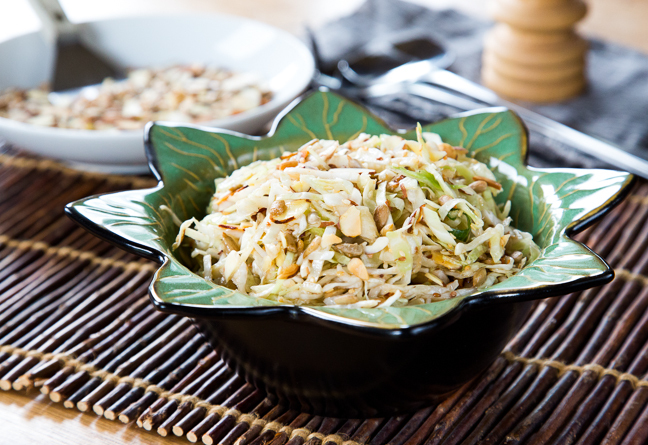 Step 3: In a large bowl toss the shredded cabbage with the prepared dressing and season to taste with salt. Add the toasted nuts and seeds and toss to coat. 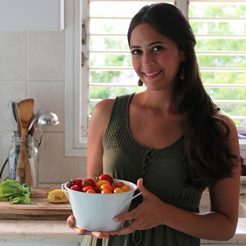 This crunchy, healthy dish is perfect anytime of the year, as a side or a main dish. Red Cabbage Stir Fry with Carrot "Noodles"